Save Your Team Countless Hours. SugarChimp syncs your lists in both directions so that you can work in your preferred application. 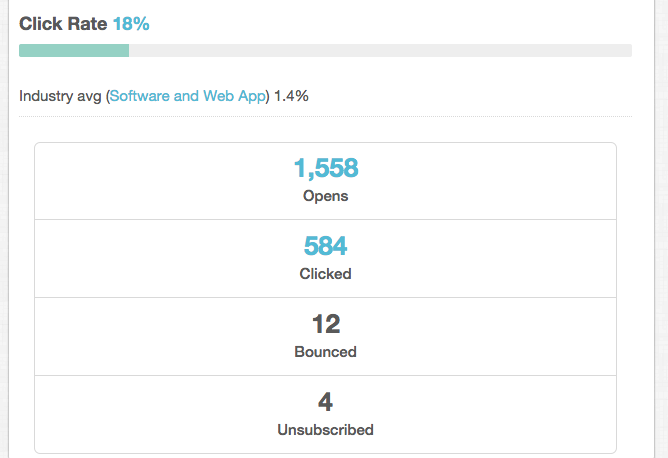 Segment and Group your MailChimp subscribers based on SuiteCRM data so you can market to the right people at the right time. Fully compatible with all versions of SuiteCRM. There's a good chance that you already understand the many benefits that come with integrating SuiteCRM with MailChimp. But wait a second… you might be thinking, I thought we were just talking about integrating SuiteCRM and MailChimp. 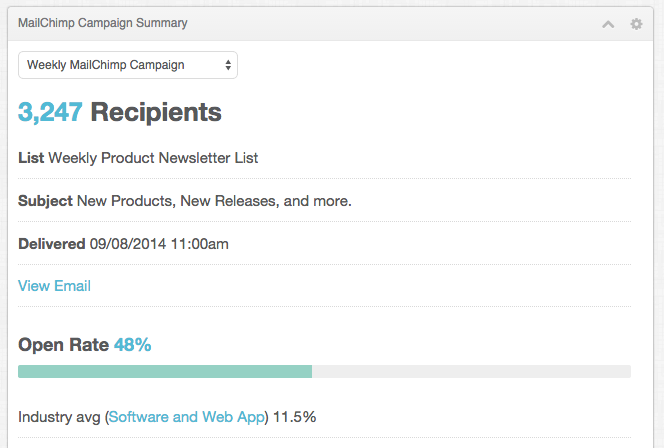 With SugarChimp, your data is seamlessly shared between SuiteCRM and MailChimp. The walls are history. The silos are history. And, maybe best of all, the annoying… and time-consuming… and error-prone process of manually syncing data between the two applications is history. For your salespeople and outreach specialists, having the right data at their fingertips is critical. That's why you chose SuiteCRM in the first place – it provides a simple, effective one-stop for the information that your team needs to communicate with customers and prospects. We realized that when we built SugarChimp, and that's why we built dashlets directly into SuiteCRM that allow users immediate access to MailChimp campaign data, as well as the engagement activity of individuals. Individual user activity reveals what activity a customer or prospect has taken. Have they been opening certain email campaigns? Clicking on product links? 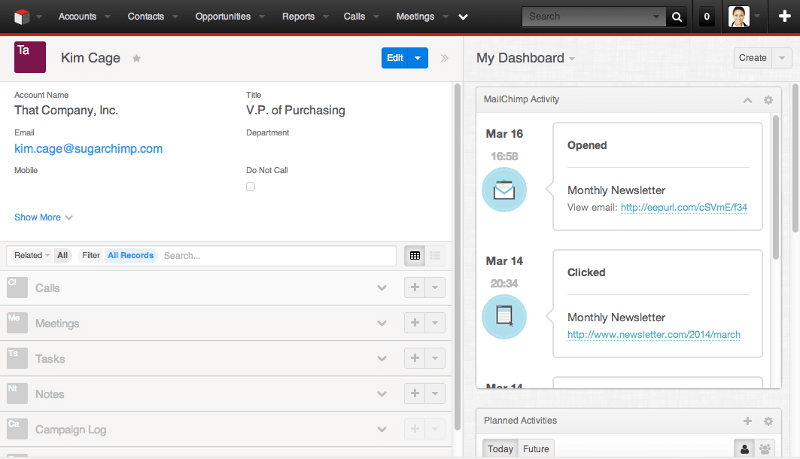 With SugarChimp, your team can see this all without leaving SuiteCRM. In the business world, that old saw "time is money" is a great example. Your team members' time is valuable, and when you can save them time, you free them up to tackle new opportunities that can advance the company and drive profit growth. If you're already manually syncing data between MailChimp and SuiteCRM, SugarChimp will free up your admin and development teams to focus on new areas for improvement. Rather than wasting time with continual manual syncing, their time and efforts can go towards creative solutions to other challenges your company is facing. For your sales teams, SugarChimp means that marketing and engagement information is right at their fingertips in SuiteCRM, in easy-to-use dashlets. No more jumping between applications to determine which prospects are primed to buy and should be at the top of their calling list… or which customers appear unengaged and could use a check-in call. Marketers are likewise empowered by having prospect- and customer-list information updated across platforms, allowing them to segment and target their campaigns effectively, using variables and fields that are consistent across both MailChimp and SuiteCRM. They can also be assured that results of their efforts are properly delivered to other teams, thereby reducing unnecessary data "handoffs" and avoiding oversights. SugarChimp can also be used in conjunction with MailChimp Automations, allowing your teams to trigger automatic email campaigns based on changes in fields within either MailChimp or SuiteCRM. This means more communication with customers and prospects, at the right times, without additional manual effort. "SugarChimp is exactly what we needed, it syncs nicely between MailChimp and SuiteCRM. The added MailChimp dashlet is very sophisticated, it’s nice to have that quick-view window when conversing with the customer. Big shout out Chad Hutchins, not only did he help out with the synchronization and work flow between systems, he gave excellent insight and provided helpful tips all around. Works great – thank you!" "SugarChimp does a great job of syncing all of our registrant information between SuiteCRM and MailChimp. We have a large number of custom fields that weren't mapping properly, and they helped get everything set up and working smoothly. They go the extra mile with one-on-one support!" "We do a lot of highly-segmented outbound marketing and SugarChimp is exactly what we needed. The list and field syncing are great, and it allows us to do more sophisticated campaigns that exactly target certain Lead profiles in SuiteCRM. The SugarChimp team is also really great, and they are totally committed to our success." SugarChimp helps create the conditions for your team and company to have the kind of creative breakthroughs that can take your business to the next level. By bringing together key marketing and engagement data from MailChimp and the customer and sales information from SuiteCRM, team members are better positioned to see the big picture and "stumble on" creative insights. With SugarChimp you don't have to worry about duplicate entries. Duplicate subscribers are never added to MailChimp and when MailChimp data is synced to SuiteCRM, SugarChimp will never create a duplicate entry. Concerned about security? Good! We are too. SugarChimp integrates with MailChimp via APIs ("application programming interface") – which MailChimp describes as a way to "allow other apps to access your account without you giving out your password". Communication between SugarChimp and MailChimp uses SSL, as does communication between SugarChimp and SuiteCRM (provided the SuiteCRM server is set up with SSL). 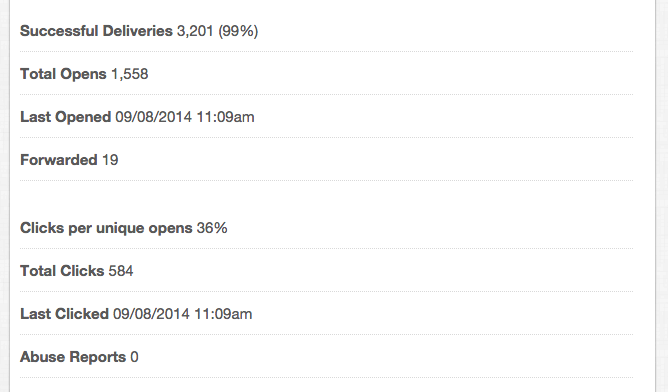 And no matter which version of edition of SuiteCRM, we provide a consistent experience across all of them. Are you facing difficulties trying to coordinate efforts between marketing and sales? The SuiteCRM & Mautic Integrator by eVolpe is the best solution that will help you solve this issue. TRY IT NOW FOR FREE! Dynamic Target Lists for SuiteCRM enables users to AUTO populate Target Lists based on one or more pre-defined conditions. This module keeps your Target Lists up to date and relevant.